IN TOWN, ON RIVERWALK, ABOVE LAS OLAS. 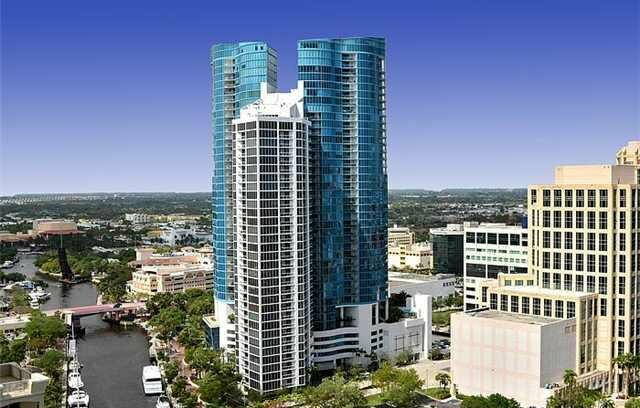 Ft. Lauderdale's Tallest Tower is the City's Most Sophisticated Residence. Walk out on your promenade overlooking the yachts along the New River. Stroll up the brick-paved Riverwalk to the restaurants and cinemas of Riverfront, the plays at the Performing Arts Center, and the latest showing at the new Art Museum. Or hop the Water Taxi and cruise to anywhere on the river. Overlooking the river and marina is your own glasss-walled European-style spa and fitness center, for residents and members only. It's complented by a groundfloor riverside cafe and the 6th floor rooftop pool and sundeck. Uniformed staff round-the-clock; includes doorman and valet parking. Waterfall lobby with water bridge and pond. Clubroom with multimedia facilities and a private library. Private catered dining rooms for special occasions. Riverside cafe; also lobby-level sundries shop and deli. Multi-level glass-walled spa and fitness center overlooking Riverwalk. 6th floor, 60,000 square foot rooftop garden overlooking river and park, with heated infinity-edge swimming pool, putting green, private cabanas and attendant services. Lobby-level travel agency and stock brokerage.